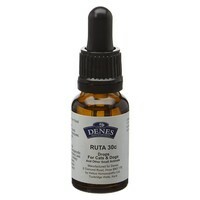 Denes Ruta Grav 30C is a homeopathic supplement that is mainly used for supporting strains. It acts on tendons especially where they attach to bone and is important in treating injuries to bone including fractures. Denes Ruta Grav can also be considered in cases arthritis especially where symptoms are worse for resting and in damp weather.